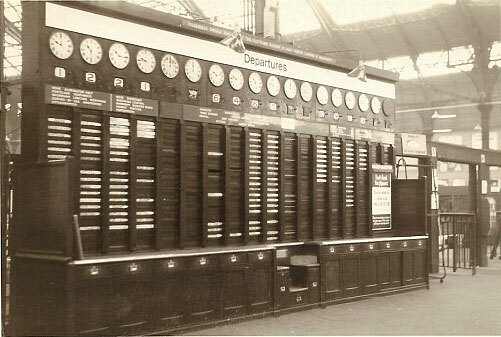 The old arrivals and departures board at Brighton Station. Photos taken in 1969 and 1979. Detail of old departures board photographed in 1979. Click on the image to open a large version in a new window. I remember it well, but what happened to it? I seem to recall it was re-located to a bar in Hove (OMAC) and then what? I believe that when it was taken down it was supposed to go to the Rail Museum at York. They were going to take it but then they changed their mind. And I think it can now be found at the Bluebell Railway in East Sussex. The arrivals and departures board featured in the picture is now in fact owned by Sir William McAlpine who lives in Buckinghamshire and has it in his railway museum. He is also the Chairman of the Hythe, Winchealsea and Romney Railway. On his land in Bucks he has a full sized 1.5 mile long railway line, yes 4’8.5″ guage, on which he runs a steam train and tender. He has a signal box that was also for the chop, and a railway station with waiting room which he had moved lock stock and barrel and re-erected at his home, and a platform ticket machine. He opens his station and runs the trains with the support of many amatuer helpers for chairty events during the year. We go there regularly and have many rides on the train, which are free once you are in. Je travaillais ici en été 1968 et été 1969 au bar, self-service restaurant et lounge bar. Je me souviens très bien de ce panneau d’affichage. I love Brighton. It’s now in the McAlpine collection, at Fawley Hill, near Henley-on-Thames. 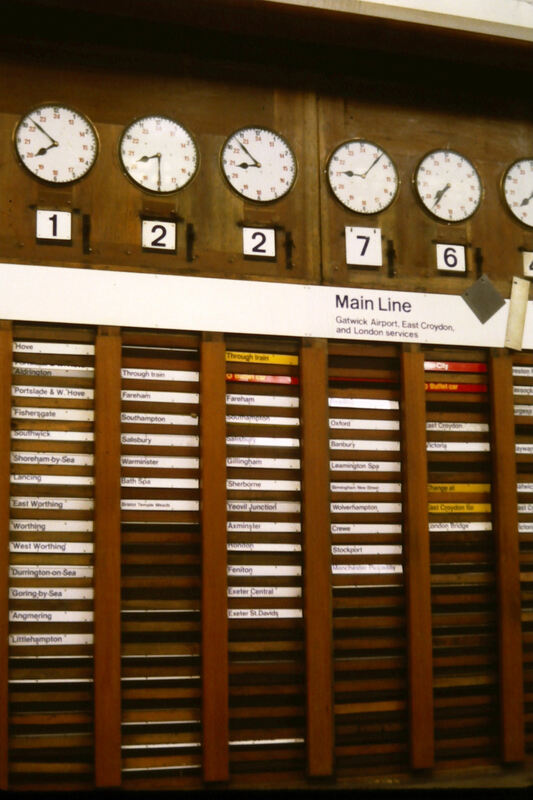 Being a very keen Train Spotter in the fifties I knew this board and departure times inside out,dont think I could remember any of them now as I’ve not lived in Brighton for nearly sixty years.